Hanoi (VNA) – The ongoing official visit to Vietnam by Director of the General Department of Politics of the Lao People’s Army Vilay Lakhamphong will contribute to enhancing the special relations between the two countries, particularly the bilateral defense cooperation, for the benefits of their people. 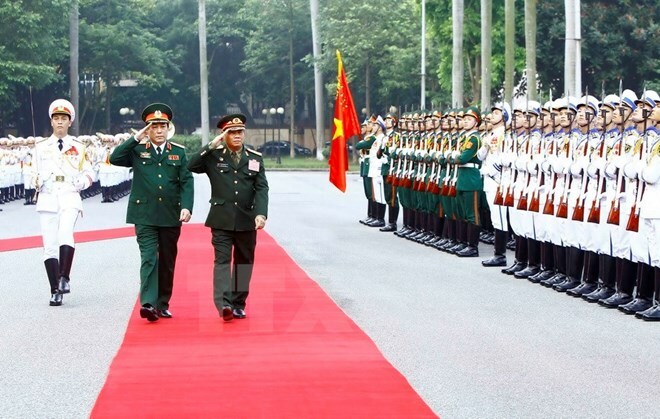 Senior Lieutenant General Luong Cuong, Secretary of the Communist Party of Vietnam Central Committee, Director of the General Department of Politics of the Vietnam People’s Army, made the statement during talks with the Lao officer in Hanoi on August 2. Cuong hailed the two countries’ advisory bodies for proactively implementing activities to celebrate the Vietnam-Laos and Laos-Vietnam Year of Solidarity and Friendship 2017, especially the successful organisation of meetings in Laos for ex-Lao military trainees in Vietnam, a military youth festival in the north-western province of Dien Bien, a culture-art campaign on the Vietnam-Laos-Cambodia fighting solidarity, and a border friendship exchange programme. Such activities are politically significant as they help increase mutual trust and educate young generations on the traditional friendship and special solidarity between the Vietnamese and Lao Parties, States and people, he added. Lakhamphong expressed his belief that sound bilateral military relations will contribute to reinforcing trust and comprehensive cooperation between the two countries’ Parties, States, peoples and armies as well as the maintenance of peace, stability and development in each nation. The two sides agreed to enhance cooperation in Party, political work, and protecting internal politics, while stepping up communications about the long-standing amity, special solidarity and all-around collaboration between Vietnamese and Lao people and armies, and promoting the bilateral coordination in training, regarding this as a long-term strategy. They also concurred to speed up the search for and repatriation of the remains of Vietnamese voluntary soldiers and experts who laid down their lives in Laos, as well as soon publish the bilingual Vietnamese-Lao books and documentary films reflecting the coordination of the two countries’ armies in the field. Both nations were unanimous to maintain delegation exchanges, especially among young officers, establish twin ties between military units, and promote culture, art and sport exchange programmes. During the working trip to Vietnam, the Lao military delegation is scheduled to meet Party General Secretary Nguyen Phu Trong and Minister of National Defense General Ngo Xuan Lich, and work with authorities of the People’s Committee of Dien Bien province.